Synthetic monitoring gives you the option of creating HTTP monitors to check the availability of your resources—websites or API endpoints. Because HTTP monitors are executed by an Environment ActiveGate, you can use them to check the availability of internal resources that are inaccessible from outside your network. Before you can use HTTP monitors you need to install a synthetic-enabled Environment ActiveGate. Click Create a synthetic monitor. Click Create an HTTP monitor. 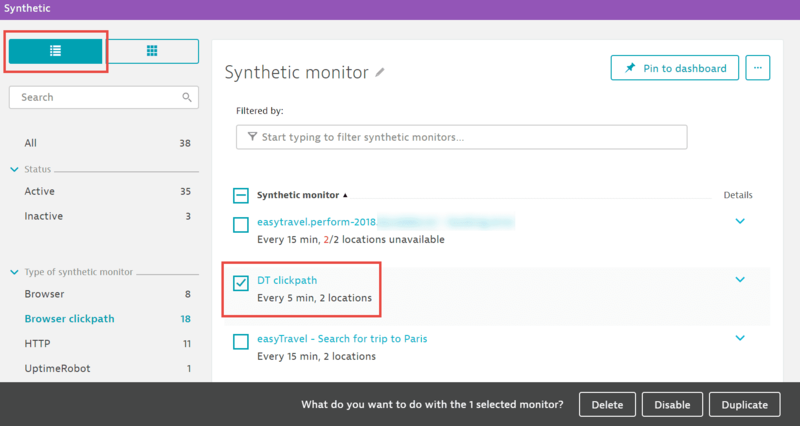 On the Create synthetic monitor page, enter a URL and Name and select a location for the Continue button to be enabled. The name is limited to 500 characters. Set up the desired options using the HTTP monitor configuration wizard. On the Summary screen, you can review and change the properties of your new monitor (Change URL or name; Change configuration). The Consumption section helps you understand how many synthetic actions the current configuration consumes. Click Create HTTP monitor to save and activate. Optionally, click HTTP to filter the list for HTTP monitors. From the list of HTTP monitors, click the monitor you want to examine. You&apos;ll then be directed to its overview page. The overview page of each monitor provides detailed results, for example, availability metrics and problems detected. While on the Availability report page, you can choose to receive a weekly or a monthly availability report and even share the report by clicking the Browse (...) button and selecting the respective option. When you first set up your monitors, reports are available after the first weekly run (made at midnight on Sundays). Click the Browse (...) button and, depending on what you want to do, select either Disable or Delete.